There’s no reining back the North East Apprenticeship Company’s (NEAC) support for the Journal’s campaign to find 500 new apprentices by the end of April. 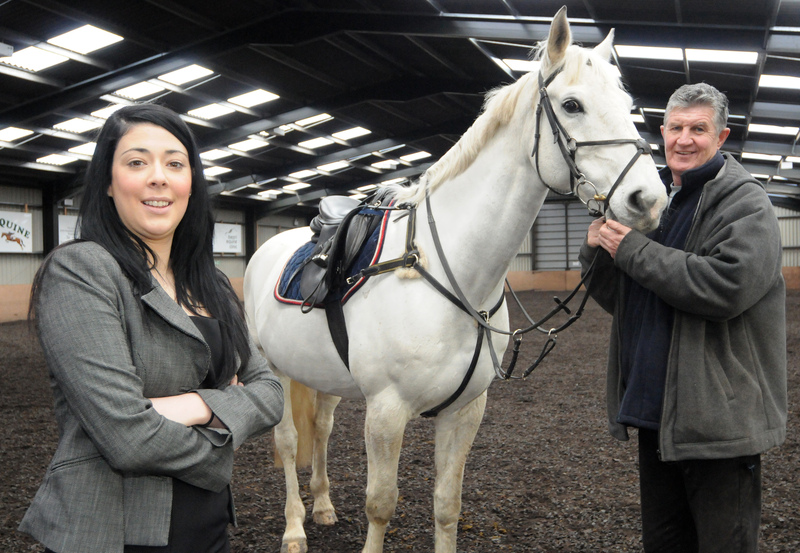 NEAC is looking to find horse loving youngsters for a County Durham equestrian centre as secures its 50 apprentice to mark 50 days since the start of the campaign. Holmside Equestrian Centre, in Burnhope, is searching for two young people with a love of all things equine to take up training places and work towards achieving an NVQ Level 2 in Horse Care. The successful applicants will work full-time at the yard and attend college on a day-release basis. Owner Peter Quigley says they will need to be prepared for hard work, adding: “This isn’t a job for the faint hearted. It’s cold and involves working outside in all weathers. They’ve got to really want this for a career. “We are working with NEAC to find young people who have a passion for horses and a strong work ethic. The candidates need to be hardy characters. “They will be mucking out, turning out and bringing in livery horses from grazing, assisting the farrier, dentist or vet and learning all aspects of care and grooming. “But there will be a great return for their efforts. As well as a good wage, they will get two years training, a solid grounding from us in all aspects of caring for horses. The British Horse Society approved centre is run by Peter and his 30-year-old daughter Danielle from a farm located near Craghead and Chester le Street. The centre provides a full range of services for horses and riders from livery and grooming to riding lessons, tack cleaning and laundry services. The apprentices will also be expected to learn and maintain high levels of customer service already offered at Holmside. NEAC aims to create over 1000 new apprentice jobs in the North East over the next few years. Almost 150 companies have signed up with the NEAC since it was launched and more than 400 potential apprentices have registered for placements. As well as handling the recruitment and selection of young people for apprentice placements NEAC provides an HR function for its candidates and delivers their training through locally-based providers. Managing director Paul Champion is backing the Journal’s campaign and wants to secure the fiftieth apprentice – and the right people for this interesting position – as soon as possible. “We are pleased to being working with Holmside as this opportunity reflects the interesting and diverse range of apprenticeships open to young people these days. “We now have more apprentices than ever signed up. It means we have an even bigger talent pool to draw on to find employers the right apprentice with the right skills for their workforce. Email info@neapprenticeship.co.uk or call 0191 490 2453 for more information. Photo caption: The NEAC’s Lucy Marshall with Peter Quigley, who’s looking for apprentices to work at his riding school. We are looking for a group of young hopefuls to compete for an opportunity to gain a business administration apprenticeship level 2 with local employers. This 6-week programme will enhance your skills to help you get hired. Working in a team, you will be able to win points for each weekly task you complete successfully. 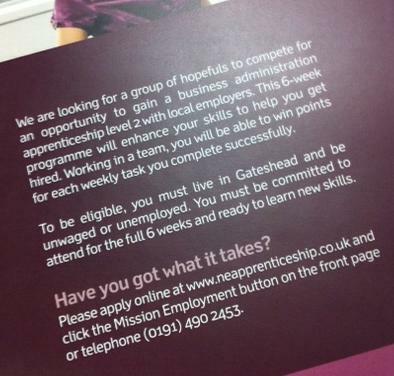 To be eligible, you must live in Gateshead and be unwaged or unemployed. You must be committed to attend for the full 6 weeks and ready to learn new skills. Your travel expenses will be paid for the duration of the 6-week programme. The article below was on Sky News Online on Friday 4th March. Its talks about young people not being employebale and suggests that business should be involved in eductaion to ensure that young people have the skills to better suite the needs of employers. It is very clear that young people need the help of employers, but also employers need the help of young people who are keen and capable ,to enable employers in meeting the future skill requirements of their businesses. NEAC is passionate about ensuring young people get a fair chance in the job market via apprenticeships, so why not, as an employer, share the responsibility of our young people and their skills. The poll, by the Chartered Management Institute (CMI), said 76% of executives agreed that failures in the education system were fuelling a skills crisis that was damaging the economy. A high number of employers said they had encountered problems with young people’s discipline and punctuality (61%), workplace skills (63%) and attitude and ambition (66%). Of the 600 managers surveyed,47% agreed that business involvement in the education process would improve the employability of young people. But, when asked, fewer than half of them said they were currently working with a school in order to do so. Ruth Spellman, chief executive of the CMI, said bad management was a serious issue in the UK with only one in five bosses professionally trained to be managers. “The cycle has to be broken and the only way to do so is for schools and employers to work together. The Tomorrow’s Leaders survey was released to mark the launch of Campus CMI – a programme developed with employers to improve the management skills of young people. AS an apprentice Paul Champion’s dream was to have a job where he carried a briefcase. Now he has a job encouraging youngsters to also aim for the top, as Christopher Knox discovers. THE North East Apprenticeship Company (NEAC) was set up last year to help cut youth unemployment and combat the region’s skills shortage. It organises and oversees the placement, mentoring and training of apprentices, which it then supports for a small administration cost on top of the apprentices salary. Launched by Gateshead Council and Gateshead College as an arms length organisation, NEAC received £25,000 in seed funding, as well as £540,000 from the Learning and Skills Council. After a successful first year – NEAC now helps to create around five apprenticeship placements per week – the firm is to become a self-funding business which generates funding from deals with training bodies and employers. The firm is working flat out to help service the increased demand for apprentices following the Government’s increased commitment to the cause. While the Government has significantly reduced it spending in many areas, its determination to invest in workplace training is underlined by its pledge to increase funding for apprenticeships by 50% – a move which is expected to result in the recruitment of 75,000 new apprentices by 2014. There is also expected to be a greater emphasis on adult apprenticeships following a £605m investment, which is aimed at bridging the skills gap in areas such as manufacturing. As the managing director of NEAC Paul Champion’s job to ensure that his organisation remains at the forefront of the apprenticeship programme and that it is meeting the needs of potential apprentices, employers and training providers. The task is particularly pertinent to Champion after he completed his own apprenticeship as a moulder and coremaker at Charles Taylor and Sons Iron Foundry in South Shields back in 1980. He said: “My first job was as an apprentice at an iron foundry in South Shields at the age of 18. “There were these old guys working there that had at been with the company for about 30 to 40 years, but they were all willing to take time out to show me the ropes. “I mean, I got the odd joke played on me, such as being sent out for long weights and a double-edged wedge, but it was all in good spirit. Growing up in one of South Shields’ less-than-affluent areas, Champion was introduced to the importance of work at an early age, a lesson that would help him get ahead during his apprenticeship. “My mother and father split up when I was young, so I spent much of my time at my grandparent’s house,” he said “My grandfather was a labourer on the docks, while my nanna was a toilet cleaner. “They both provided me with a really strong work ethic and the belief that I would be able to make my way in the world with the help of good old-fashioned hard work. “You had to have that belief working at Charles Taylor’s, as the place was less than safe or hygienic. “I remember that we used to wash our hands before lunchtime in something called the bosh, which was basically a tank full of dirty water, which probably had rats running through it. “Then we’d sit amongst the squalor to have our lunch. There was a canteen but we would rather eat where we worked. “Although I was much younger than everybody there, I nevertheless felt part of a team, which was really important to me. “Growing up I had been part of rugby and football teams, so working with others was vital to me. It was during this time that Champion began to appreciate the value of mentoring and support, particularly during times of hardship. He said: “The early 1980s recession saw the factory’s workforce shrink considerably. However, I was still supported through my training by the managing director of the firm, who actually paid me out of his own pocket, despite being worried about the short-term future of the business. “It was during this time that I started to have an appreciation for the bigger picture. If we didn’t have enough work coming in then people couldn’t get paid. With a lack of work at the foundry, Champion found himself faced with a number of training opportunities, and underwent a secondment within the firm’s technical management team. However, his choice of role was very much dependant on one thing. He said: “To me, it was always important to have a briefcase. I remember my dad having one in his room when I was really young. I used to look at it and think to myself, ‘I’ll be using that when I’m older’. “When I was given the opportunity to experience a management role I jumped at the chance as I knew it would let me carry around a briefcase without looking daft. With more and more of the firm’s market being passed over to areas such as India and Brazil and ongoing uncertainty at the foundry, Champion left to start up his own printing company, which made business cards and party invitations. At the same time, he launched his own personal training and coaching business, which would eventually fund his studies at South Tyneside College and allow him to study the GCSEs that passed him by as a result of his early introduction to working life. On completion of his studies he managed to secure a job as sports development officer at Gateshead Council, which then allowed him to complete a spots studies degree at Northumbria University. He said: “During my time at Gateshead Council I organised the summer sports schools, recruited staff, booked coaches and facilities. “I then moved on to seeking funding through the Single Regeneration Budget and developing and managing the Sports Development Outreach Programme across Gateshead. With a number of the council’s sports contracts coming to an end, Champion successfully applied for a regional manager position at crime reduction charity Nacro. The charity works with some the most disadvantaged people, offenders and those at risk of offending, to help them find positive alternatives to crime and to achieve their full potential in society. Champion said: “The work that Nacro did in the North East was all about building up respect among these young offenders. “Although young people get a hard time in this country, the fact is that most don’t want to re-offend. “Back then, many of the people that worked for Nacro would have been known as ‘hard men’, now they are probably known as community leaders. “The youngsters looked up to these people and it was through their guidance that we tried to foster a sense of respect and pride in their community. With a determination to continue improving the prospects of underprivileged people in the region, Champion then took on the role of director at North East firm B-Skill, which works with employers to provide training for their existing staff, particularly in lesser paid roles such as cleaning and manual handling. Champion said: “At B-Skill, we built up from a small business to one that was providing training on a national business. “Most of the time we were working with people who had left school 30 or 40 years ago and didn’t have a qualification to speak of but needed to find training because of changes to their role. Now at NEAC, Champion is determined to use the apprenticeship programme to provide job opportunities for youngsters in the region who, as a result of the economic downturn, face an uphill struggle in the search for work. He said: “We thought we’d be quiet leading up to Christmas but were been really busy, and continue to be. NEAC is also throwing its weight behind The Journal’s 100 Apprentices in 100 Days Campaign, which has already succeeded in helping to find positions for over 260 apprentices, with the new target now raised to 500 in 100 Days. Champion said: “The campaign has already proven hugely successful and we would urge other employers to consider whether they could benefit from an apprentice. If you had a talking parrot, what’s the first thing you’d teach it to say? What newspaper do you read, other than The Journal? Which historical or fictional character do you most admire? For ensuring that young people have a chance, and sometimes a second chance to find their place. And promoting the concept that all of society has a shared responsibility for this. Hundreds of thousands of young people are doing vocational courses which do not lead to university or a job, a report says. A review commissioned by ministers recommends a radical shake-up of vocational education in England. It says all pupils should study a core of academic subjects until they are 16. And it calls for changes to the school league tables so some vocational qualifications are not counted. At the moment, some qualifications count for the equivalent of four GCSEs. The report says this, coupled with the funding arrangements, provide “perverse incentives” for students to be steered in to notching up strings of qualifications which may not help them in to work or higher education. And this is at a time when young people are facing a very difficult labour market, it says. The review has been carried out by Professor Alison Wolf, an expert in education and skills. Her report says: “The staple offer for between a quarter and a third of the post-16 cohort is a diet of low-level vocational qualifications, most of which have little to no labour market value. Her report says the current funding system encourages colleges to put students through a lot of qualifications – but not to continue to improve their core skills in English and maths if these are lacking. It calls for changes to the system of funding and regulation, longer-term work placements for older pupils and greater involvement of business and industry. At the same time, schools should no longer have a duty to provide work-related learning, including work experience, to all pupils over 14. Prof Wolf says funding for pupils aged between 16 and 19 should be per student – not per qualification – as it is at the moment. She believes children should study mainly academic subjects until they are 16 and that if they do not get a good GCSE in English and maths by that age, they should be made to continue with those subjects. “We’ve got more than half our 15-16 year olds failing to get good maths and good English at GCSE the first time round and two years later it’s no better,” Prof Wolf told the BBC. Until 16, she says, pupils should spend 80% of their time on core subjects. Education Secretary Michael Gove said the government would reform the system: “The system that we have inherited is very damaging. It is unfair for children and it is harming the economy. He said high-quality vocational courses were “immensely valuable”, giving access to “great education and great jobs”, and should be available to all children. “We will reform league tables, the funding system, and regulation to give children honest information and access to the right courses,” he said. The Wolf report calls for more high-quality apprenticeships for young people aged from 16 to 18. Employers should be part-subsidised to offer such apprenticeships, Prof Wolf believes, if they offer wider training. The report also says it should be made easier for teachers from further education colleges to teach in schools and that colleges should be allowed to take pupils from the age of 14. The government is already planning to open new University Technical Colleges, where pupils could go from the age of 14 to do work-based training and core academic lessons in English and maths. Vocational qualifications taken in schools and colleges include Btecs, City and Guilds and OCR Nationals, and cover subjects ranging from IT and construction skills, to dance, hospitality and catering. The bodies which provide them say they are keen to work with the government to implement the findings of the review. A spokeswoman for Pearson, which provides the Btec qualification, said: “We were clear in our submission to Professor Wolf that we believe that any qualifications a young person takes must help them to progress in their lives. “Research indicates that the value of our qualifications, like the Btec, is very strong in this respect. OCR said it wholeheartedly supported the findings of the Wolf review. A spokeswoman said: “The recommendations safeguard the interests of young people with measures that can support real progression, raise the quality of vocational provision and, crucially, secure core achievements in English and maths”. Martin Doel, the chief executive of the Association of Colleges, said the difficulties facing young people in today’s labour market were not a reflection of the quality of vocational education per se, but were related to the state of the economy and “the challenges colleges and others face in picking up the pieces where pupils leave school with few or no qualifications”. The National Union of Teachers says it is pleased the report recognises that it is essential pupils are not “herded into one type of education or another at far too young an age”. More about NEAC at www.neapprenticeship.co.uk or email info@neapprenticeship.co.uk Tel: 0191 490 2453. 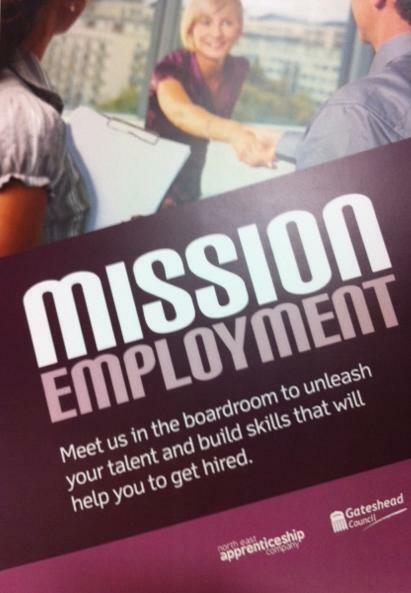 In the Recruitment Sector? Fancy a chat? Hi, I’m looking for some ‘mainstream’ recruitment agencies to contact me to have a chat about some ideas that I have with regard to apprenticeships within employers. I want to chat to agencies around the UK but would be very interested in agencies in and around the North East. I feel there is some good work that could be done by NEAC in partnership with other agencies, using creative ways of working, and I would like the opportunity to have a chat about how we can invest in the future skills of the workforce ‘together’ by investing in young people. If you want to find out more, e-mail me at paul.champion@neapprenticeship.co.uk, or call me on 0191 4902453. Maybe we can create something great through a very small investment of our time? 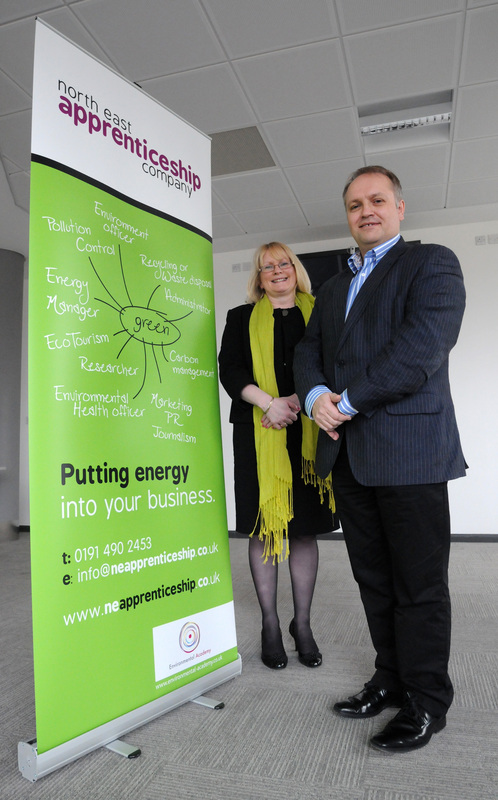 The North East Apprenticeship Company (NEAC) is launching an initiative to recruit new apprentices for ‘green’ training places. The programme kicks-off during National Apprenticeship Week 2011 (next week Monday 7th to Friday 11th Feb) and is aimed at finding potential young apprentices for future employment specifically in the environmental sector. Planned job roles and targeted sectors will include environment officer, carbon management and eco tourism as well as recycling, waste disposal and pollution control. The move comes as the environmental sector is expanding due to increasing concern about climate change and pollution and will see NEAC working towards becoming the first organistaion of its type to achieve an environment award from the Environmental Academy. The Swalwell-based Academy is a national training and consultancy company which provides businesses with support on environmental, quality and health and safety issues. It was established to help industry, commerce and the education sector to meet growing demands of new legislation in these areas, offering consultancy services for people working in the environmental sector or looking to CPD with professional tuition. The first new NEAC apprenticeship to be launched, in partnership with the Environmental Academy, will be for apprentice environmental management administrators with green apprentices starting work very soon. Training will be delivered in partnership with WBL Providers and Colleges and those who participate will, as part of their apprenticeship, help employers find new ways of reducing their carbon footprint – as well as assisting them in working towards achieving internationally recognised quality standards like ISO 14001. Apprentices will learn how to undertake, for instance, green audits for their employers as part of the skills training they receive. This will enable them to identify areas where improvements can be made, boosting their employers’ environmental credentials and helping them reduce carbon emissions and recycle more. NEAC managing director, Paul Champion, said: “The green job market is growing due to increasing concern about climate change and pollution, and as a result tighter regulations are affecting more businesses than ever before. “We have partnered with the Environmental Academy to support Green Apprenticeships and encourage business growth through environmental training and awareness. Rita Callendar, managing director of the Gateshead-based Environmental Academy said: “We are very pleased to be working with NEAC on this innovative new programme. 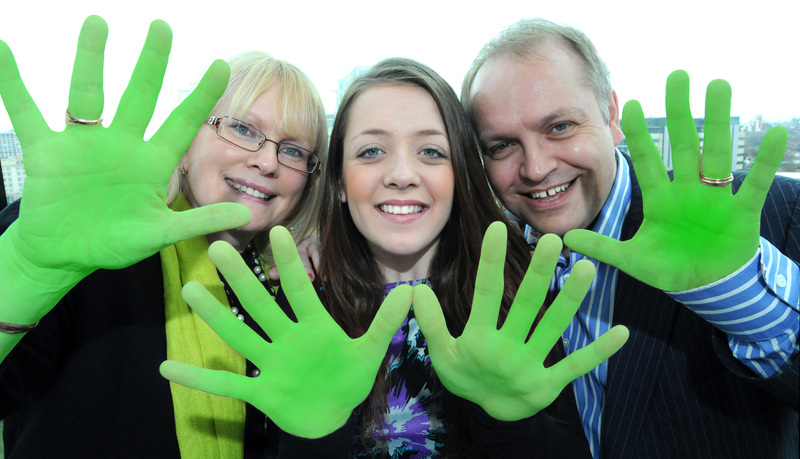 “For a company hiring a green apprentice the benefits are great. This is an opportunity for the business to show a first step taken towards showing environmental management expertise or to enhance their existing arrangements. Apprenticeship Week 2011 aims to highlight the talents and skills of apprentices and celebrate the value of apprenticeships. More about NEAC at www.neapprenticeship.co.uk or email info@neapprenticeship.co.uk blog: www.apprenticeshipblog.com Tel: 0191 490 2453.